These Chipotle BBQ Potatoes are my new fav for summer. Slightly spicy easy to make and the perfect side for grilling. I am super excited to share this recipe with you today. Recently we updated our team building menus and added these Chipotle BBQ Potatoes to our Cabo Wabo menu. We are roasting them in our classes but you could just as easily wrap in foil and cook on the grill. With the onset of summer, I have been cutting back on gluten, reducing my sugar and carbs. It is a mix of my Arbonne 28 day challenge and Weight Watchers. I am not a good eliminator, not an all or nothing girl so I am trying moderation for more of a life long change. Have you noticed that losing weight only gets more difficult as you get older? Living in a hotel again for 90 days certainly did not help! These are only 3 points – paired with a grilled protein and salad makes for a very satisfying meal when I am craving something a little more. 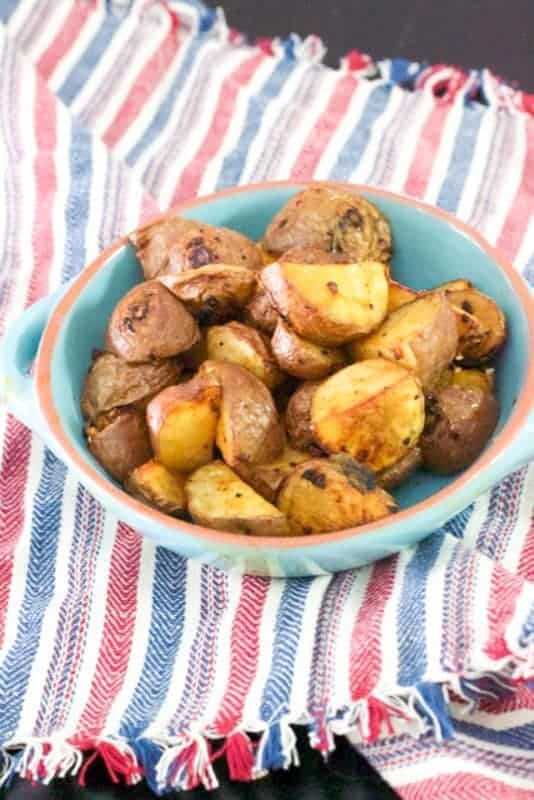 This is how easy they are to make – cut up your potatoes, toss with the spices and adobo sauce and pop in the oven. 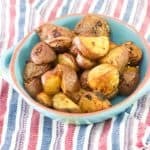 The adobo sauce, which is the sauce in a can of chipotle peppers, adds very mild heat but kicks up the flavor of roasted potatoes. Finish the cooked potatoes off with some chopped cilantro and they are ready to serve! 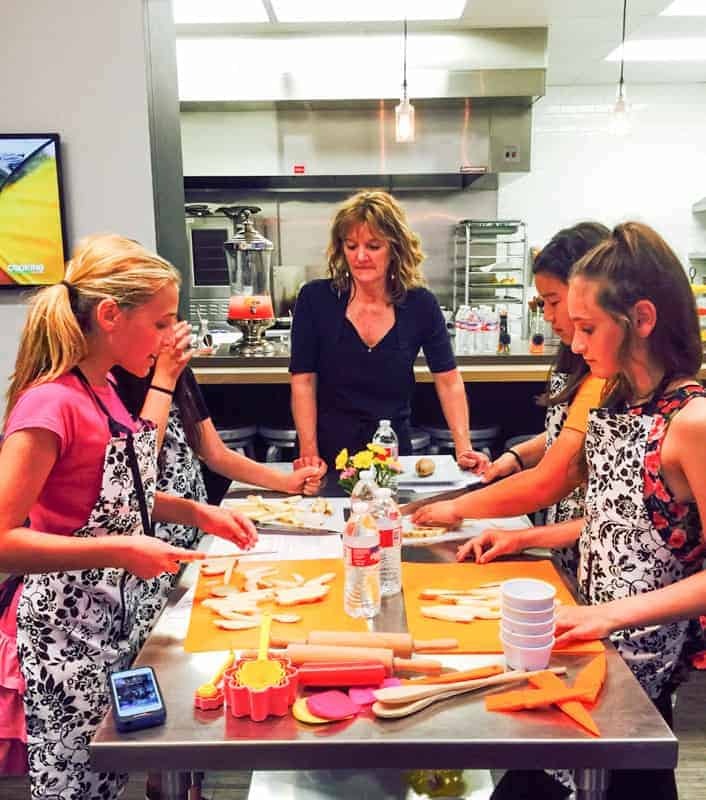 If you live in Orange County and are looking for activities for your young chefs this summer, check out our Kids Mini Camps. We are excited to cook and create with young chefs. Easy, flavor filled side dish. Roast or place in foil packs for the grill. Preheat oven to 425°F. Place the halved potatoes on a baking sheet. Drizzle 1 tablespoon of olive oil over the potatoes. Add salt, pepper, smoked paprika, cumin, garlic and adobe sauce; toss until the potatoes are thoroughly coated with oil and seasonings. Place in the oven for 35 to 30 minutes, stirring once, until golden and the potatoes can be easily pierced with a fork. Sprinkle with fresh cilantro before serving. Got a copy of your Chipotle potatoes and they sound delicious.